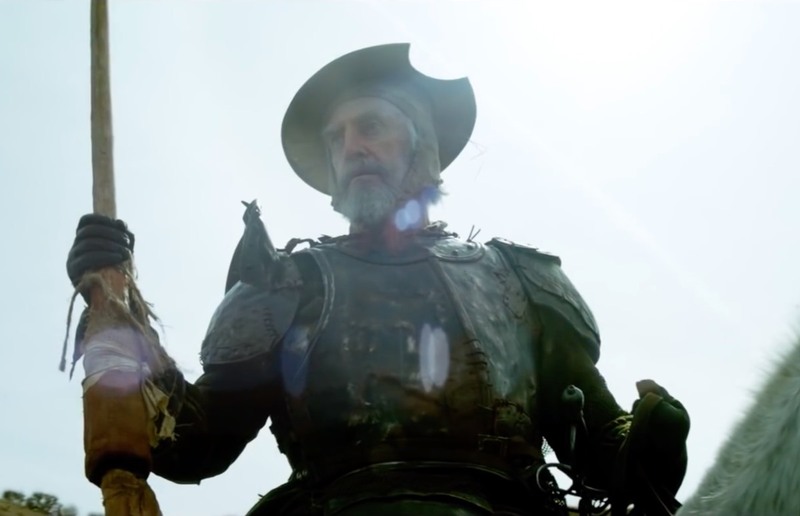 It’s been 25 years in the making, but The Man Who Killed Don Quixote, director Terry Gilliam’s tribute to the classic Spanish novel, has finally hit the silver screen. The project has foundered and been revived so many times, it became a poster child for Hollywood’s notorious development hell, with a reputation of being cursed. But Gilliam persevered, and while the finished product isn’t exactly a masterpiece, it definitely reflects the singular vision of one of our most original filmmakers. Miguel de Cervantes’ Don Quixote is inarguably one of the most influential works of Spanish literature. The book is written in the picaresque tradition, which means it’s more a series of loosely connected episodes than a plot. It follows the adventures of a nobleman (hidalgo) named Alonso Quixano who has read far too many chivalric romances and becomes convinced he is a knight errant. With his trusty peasant sidekick, Sancho Panza, he embarks on a series of random tragicomic adventures, with the Don’s hot temper frequently getting them into scraps. (Sancho usually gets the worst of the beatings and humiliations.) Don Quixote is the archetype of the delusional dreamer, tilting at windmills and believing them to be giants, preferring his fantasy to mundane reality.